Man and machine… The unlikely rally cat Ed Abbott used to build racing Saabs but loves the XJ-S… Words and photography Paul Hardiman. As a putative rally car, an XJ-S isn’t the obvious choice. But when you were on the development team, and you know them inside out, the prospect looks less daunting. As an insider, Ed knew what he was looking at when he found this one five years ago. ‘It wasn’t rotten, and it was one of the rare 10:1-compression cars made for a year before the 12.5:1-compression HE appeared in 1981. They started in 1976 with 9:1 and 285bhp. It didn’t handle or go particularly well but it had potential. It’s got perfect suspension, adjustable for castor and camber.’ Before Abbott Racing was formed in 1982, racing first Fiestas and then Saabs, Ed had rallied an A40. ‘But Norman [Dewis, Jaguar’s chief tester] said I had to give that up as I needed to be working seven days a week. We were preparing and testing all the press cars, and the XJ-Ss had to be faster than the XJ12s. 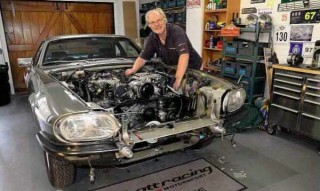 ‘The XJ-S’s biggest claim to fame was as The Saint’s car until Tom Walkinshaw started racing them. But Jaguar had homologated the model for Group A well before that, with the option of a five-speed manual gearbox and eight axle ratios, the first rally we did was the Three Castles in 2016, to convince my wife it was safe. I’d had a big accident in my MkV Jag on the 2005 Rally of the Tests, crashing into a river and nearly drowning, so she banned me for a bit. The V12 runs cold-air intakes that add about 15bhp, as used on the press cars, and it even has working air-con. The press cars’ systems were modified to disengage the pump on acceleration runs, but Ed thinks none of the journalists at the time knew that.